Properly protecting the investment that you have made in your home, business, or vehicle is crucial for safety. It is important to find a company that offers the best security products on the market today. At J.R. Shoup, LLC, we constantly strive to give you cost-effective solutions, and always keep the most up-to-date, highest-quality security devices in our inventory. Along with the sale of our merchandise, we also provide service and repair services for existing security systems, as well as the installation of brand new products. Safes: Whether you are trying to protect your valuables from a fire or from burglars, our inventory is sure to contain an ultra-secure safe that adequately serves your needs. Keys: We have one of the largest collection of key blanks in the entire State of Ohio. 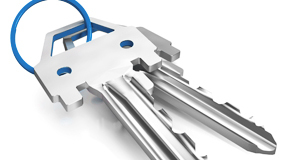 If we don’t already have it, our team can quickly locate and special order any other keys you may need.